Have a listen and hear about fear and loathing on the airway education trail, how an ethicist might possibly arrive by helicopter and save your life by stabbing you in the neck and where Peter Singer fits into critical care education. Subscribe to the podcast on iTunes. It might be the crucial thing that was missing in your life! 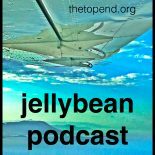 This entry was posted on April 3, 2019 by Dr Doug Lynch @TheTopEnd in Prehospital Jellybeans, Pure Jellybeans and tagged airway, Ethics, Flight-Pararmedic, Humour, Learning, Medical Ethics, paramedic, Research.